Within days of announcing the closing of SoKo Fashion, customers came out in droves searching for answers & of course seeking out some amazing deals. 2. 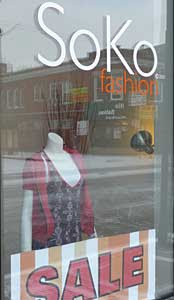 SoKo was presented with 2 offers from customers who were just unwilling to accept that SoKo was shutting its' doors. The first offer was to buy the business. The second offer was to partner with owner, Sheri Roney. WooHoo! We decided to go with the latter and partner with our long-standing customer who has also become a great friend to the owner! Let us introduce Amanda Wood! No seriously, we want you to come to our meet 'n greet with Amanda on March 12 from 6 p.m. - 8 p.m. More details to come. With that said, please note the final day of our 40% off sale is this Sunday, March 1. We are so thankful to have such loyal and dedicated customers, because without you this wouldn't have been possible. It really does take a community to raise a business. Thank you. this store is such a disaster. no wonder ms roney had to close her doors or find help. there is nothing in this so-calle dboutique that offers anything fashion forward.